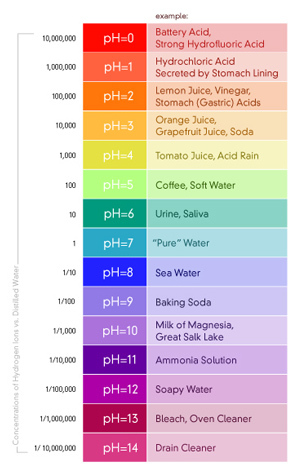 The pH can be raised by feeding soda ash (sodium carbonate), caustic soda (sodium hydroxide), sodium bicarbonate, or potassium hydroxide into the water. Calcite (calcium carbonate, CaCO3) and/or Corosex (MgO—magnesium oxide) are used as filters to increase pH from the 5 and 6 range. The peak flow a neutralizing filters is limited to about 6 gpm per square foot of medium. Downflow filters must be backwashed frequently to prevent “cementing” of the bed. Upflow filters do not experience cementing of the bed, but they do not work if iron is present in the water.